In 1997 two steel canisters with electric heaters were installed horizontally in the rock. Photo: Birgitta Kalinowski. Although there are considerable differences in altitude between the bedrock at Forsmark and the Swiss Alps there are also similarities, similarities that are large enough for SKB to participate in some of the final repository test that are being conducted there. The Swiss hard-rock laboratory is located at the Grimsel Test Site about 2,000 kilometres south of Forsmark at an altitude of just over 1,700 metres above sea level. Here, as at SKB’s underground laboratory at Äspö north of Oskarshamn, research on the final disposal of spent nuclear fuel is taking place. The Grimsel Test Site is operated by Nagra, the Swiss counterpart to SKB. In 1997 two steel canisters with electric heaters were installed horizontally in the rock. The canisters were surrounded by a perforated steel cage encased in bentonite clay and the gallery was sealed with a concrete plug. A grand total of 632 sensors were installed to make it possible to make direct measurements of the clay, the rock and the heaters during the course of the experiment. These included temperature, humidity, total pressure, movements and portal pressure. The heaters in the canisters maintained a temperature of about 100oC to simulate the heat that will be generated by the canisters with spent fuel in the final repository. SKB has been involved in this experiment since the beginning, says Erik Thurner, SKB’s contact person for the Febex experiment. The Febex experiment has been based on the Spanish final repository concept, in which the fuel is encapsulated in steel instead of copper as in Sweden. The rock in Switzerland is composed of granite like Forsmark’s bedrock, but is drier and the ground water has a lower salt content. “What we are mainly hoping for is even greater understanding of the processes in the bentonite clay, in this case with other conditions from those which the KBS-3 method is planned for, in terms of the bedrock, the groundwater, the canister and the design of the concept. 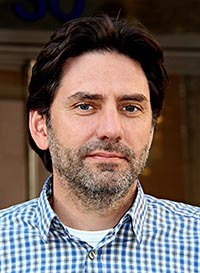 For instance, we are interested in saturation of the clay and how the bentonite has integrated with the concrete in the plugs and the iron in the canister (heater),” Erik Thurner explains. The clay used is called, like the entire experiment itself, Febex. SKB is interested in studying this clay, along with other kinds of clays, to gain greater understanding of the qualities of different clays and the differences between them. The first canister was removed from the rock at Grimsel after 5 years and now, in 2015, the second canister has been removed. This work went on until August and more than 1,000 samples of bentonite clay, cement and rock have been taken during the process. The samples have been sent to a number of different laboratories all over the world. “We are going to analyse some of the samples in our own chemistry laboratory at Äspö and also make some advanced analyses of the bentonite clay in our science material laboratory at Äspö,” Erik Thurner says. 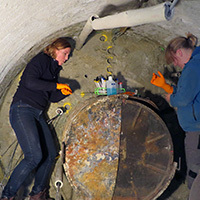 Birgitta Kalinowski, SKB, and Manon Fruchi, Switzerland, taking microbial samples. Photo: Maria Villar, Ciemat. “We are mainly interested in seeing if there is any microbial activity in the clay and if so, what microbial process are going on. It is probably too hot and dry for them to survive closest to the heater. That is why we have taken clay samples in a cross section from closest to the heater toward the surrounding rock. The further away from the heather the greater the chance to find active or at least viable microorganisms. SKB is particularly interested in studying whether there are any sulphate-reducing microbes in the clay or not. These can convert sulphate into sulphide, which is a substance that could attack the copper canisters in a Swedish repository. It would also be interesting to see if the microbes have affected the clay and its qualities in any way. The next step will be to analyse all the samples from the experiment and then evaluate them. The project hopes to be able to present a report on the findings from the experiment during 2016. Grimsel Test Site is a hard-rock laboratory with a kilometre-long tunnel in the Swiss Alps, or more precisely the Aar Massive. The laboratory was constructed in 1983 and is operated by Nagra, the Swiss counterpart to SKB. The aim of experiments at Grimsel is mainly to answer questions that arise during analysis of the long-term safety of a final repository for radioactive waste as well as questions of a more technical kind relating to installing, operating and sealing a final repository. The full-scale Febex test canisters were installed in 1997 and originally this was an EU project initiated by the Spanish waste company Enresa. Since 2008 the experiment has been operated by a consortium to which five organizations belong: SKB (Sweden), Posiva (Finland), Ciemat (Spain), Nagra (Switzerland) and Kaeri (Korea).